When I saw this painting at the Hamburg Art Museum, I felt like I had met a kindred spirit. After seeing about 200 paintings about crucifixion, I was finally among artists who understood my obsessions. A two-month long binge on tuna melt sandwiches – YES! Mackerel in tomato sauce – YES! Pickled herring by the pound – YES! Fried and breaded fish – YES! Octopus rings – YES! (Well, technically there aren’t any octopus in the picture, but a girl can dream). 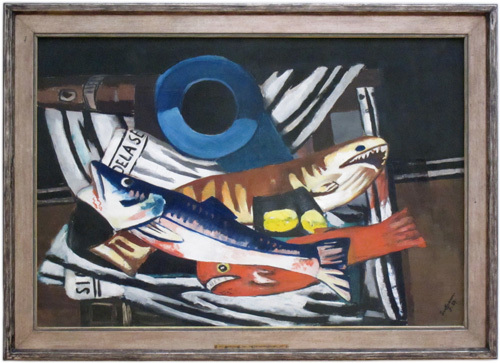 Large Still Life with Fish, 1927, by Max Beckmann.